Full HD (1080p) camera. 2.19MP Sony Exmoor image sensor improves the quality of day and night recording. Comes with an intuitive Mobile App for iOS and Android that enables Live View streaming and allows users to save videos to their smartphones via Wi-Fi, as well as being able to control various device settings. The camera is 140-degree wide angle. Multiple Recording Modes: Continuous, Incident, Manual, Parking with Self-Protection with Thermal Sensor, Super Capacitor with Fail-Safe recording. Dual Save Technology guarantees backup copies are saved in the internal memory after any incident. Also by using Ambarella A7 CPU it provides the best performance for HD recording and processing, while minimising power consumption. Generally, the device is a fairly good looking one. It is reasonably small, so it doesn’t get in the way of your view. It is actually small enough to be mounted behind your rear view mirror. 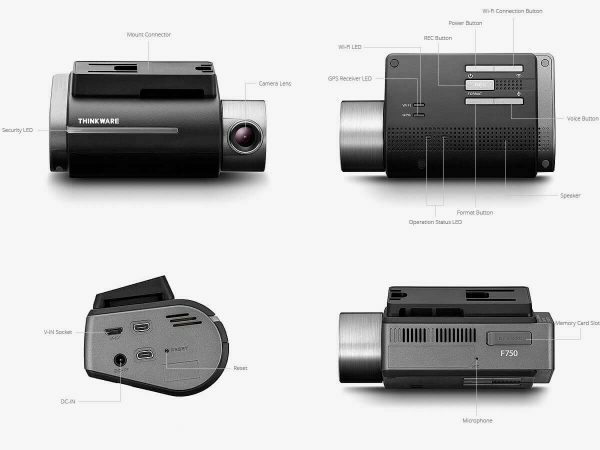 It comes with a rotating camera lens which can be adjusted to give you the best possible view. An LED in the front can be enabled to tell others that you are recording. A couple of LEDs at the back give you Wifi and GPS status. Apart from that, the back also has buttons to let you turn the system on or off, or connect it to your phone via WiFi to view videos. A couple of other buttons let your format the SD Card (a bit too easy, if you ask me!) as well as a Voice button. One thing clearly missing from the device is a screen. While a screen is not really needed while driving (you can just see out of the windscreen! ), but it does make it helpful when you want to view videos or set the device up originally. The setup needs a phone to be handy, with Android or iOS on it. You can download the apps via their respective stores for free. There is also an app available for your Mac or PC which can be used to view the videos. You open the app, you press the WiFi button and then connect to the camera via WiFi. Using this app, you can see the view outside and you can then adjust the level of the camera. You can also adjust various settings such as warnings and other features. So the camera actually comes with a micro SD card. This is quite nice, as normally you have to fork out on more. I did read somebody complain on a forum that their device wouldn’t accept any bigger cards than the one that came. I didn’t have one handy so I sadly cannot try. Anyway, the camera has a built-in memory as well as an SD card. This means that it records any incidents to both places, ensuring you have two copies, just in case. Quite a handy feature if you ask me. Video capture is provided in modes that are fairly standard to dashcams, i.e. incident, continuous or parked. What it does restrict you is by only letting you record in 1-minute bursts. That is it. No longer, no less. However, the video quality is extremely clear. It captures both daytime images as well as night ones reasonably well. If you watch a video on your computer using a regular media player, it gives you no more info apart from a time stamp. However, if you use their software, it gives you GPS and speed as well. The other way to view videos is via the app, though that is quite slow compared to using a computer. For us, the top two worked. It is normally indicated via beeps, and while useful, it does get annoying after a while. You can adjust the sensitivity to some extent, but it doesn’t make much a difference. Once again, having no screen makes this slightly awkward, as you get beeps but no idea why. The Forward Collision Warning System was too sensitive in my opinion, as it constantly beeped in stop start traffic. Lane guidance was better as it only clicked on over 30mph. 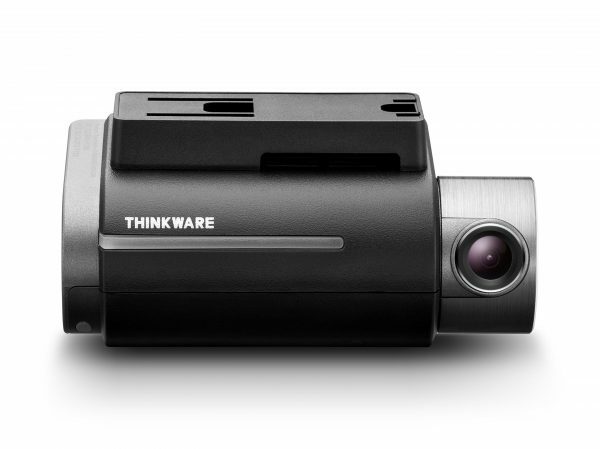 More about the Thinkware F750 can be found on their website. It is available from various online retailers including Amazon, and retails currently for £159. Lack of screen means this device lacks a few features we deem normal in Dashcams. However, it makes up with the good video quality, and the extra safety features thrown in. With the reduced price, and the ability to hardwire it in, this is a complete solution for anybody who seeks to install a dashcam in their car. Previous story EaseUS Data Recovery Wizard Pro 11.0 – Making lost file recovery even easier!